The interactive map allows residents to type in an address to determine which capital improvement projects are happening in their area. By clicking on the highlighted roads in the map, residents can view information such as the year of the construction, project status, and a description of the work. While the interactive map only includes major Village projects. 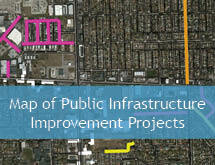 Smaller projects, such as sidewalk or curb removal and replacement, are not displayed on the construction map. If you have questions about a project that is not included on the map or you would like additional information on a particular project, please contact the Engineering Department at (817) 671-8304. The Village of Franklin Park, as part of an on-going street reconstruction/resurfacing project, will be removing and replacing the existing asphalt paving and making spot repairs on your street. The work is scheduled to take place between Tuesday September 13 through Friday September 23. The contractor will start with the grinding pavement removal and follow up with the binder paving work toward the end of the week. The surface course would be scheduled for the week of September 19. Once the pavement has been removed and the binder has not been placed yet, you will not be able to get into or out of your driveway. The street will be available for overnight parking (the parking restrictions only apply during working hours). The contractor, Schroeder Asphalt Services, Inc., will work from 7 AM to approximately 5 PM. The work will require the roadways to be free of parked vehicles. We are asking for your cooperation with keeping the street clear of vehicles during this period. No Parking Signs will be posted prior to the commencement of any work. Access to businesses/residences may be temporarily closed to accomplish the work. A 24 hour notice will be given to the affected property owners. Traffic will be limited to one lane for short periods of time during the paving operation. We appreciate your patience and cooperation during the period of construction. If you have any questions or concerns prior to the commencement of work, please call the Village Engineering Department at 847-671-8217. For questions during construction, please call Jimmy Samaniego at 847-260-5807, or speak to the Schroeder Asphalt representatives on site.